It’s beginning to feel a lot like Christmas! I am actually writing to you from 35,000 elevation, on our way home from New York City. 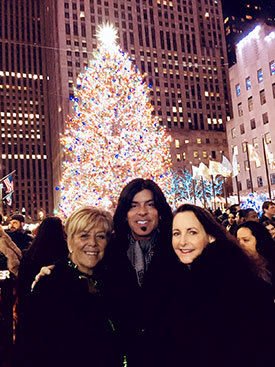 Our first “Wholetones Christmas in New York” contest winners had the time of their lives! Lillian and I met Alison O’Neil and Sandy Barnes Cairns at the Langham Hotel on Friday, and we hit the town running! First stop, “Omar’s” Mediterranean restaurant. Then we walked 5th Avenue in Midtown until we found “Igloos,” on a rooftop at 230 5th Ave. What a view! Then we visited one of Alison's friends who has an apartment on the 55th floor with panoramic views of New York City and New Jersey…absolutely breathtaking. Then we walked back to the hotel. Saturday after breakfast, we went to the Christmas village in Bryant Park. Amazing kiosks with food, art, crafts, jewelry…even truffle oil! People were ice skating, shopping, laughing and taking pictures of the beautiful decorations. From there, we braved the iconic Macy’s flagship store with it’s famous decorations, then back to the hotel to get ready for our big night. 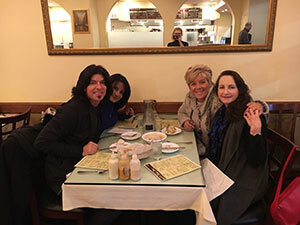 We had dinner at Chef Geoffrey Zakarian’s restaurant, “The Lamb’s Club,” and then walked to our highlight of the trip, “The Rockettes Christmas Spectacular” at Radio City Music Hall. Even though I had heard about the legendary “Rockettes” from my wife Lillian, who grew up in North Bergen, NJ… I was not prepared for what I was about to see. The show was absolutely mind-blowing. Some of the best set designs, special effects, not one, but two pipe organists, and of course, the incomparable Rockettes! 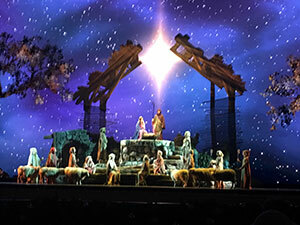 Our special guests could not believe their seats; we were 5 rows from the stage in the center…perfect location! No need for a “spoiler alert.” I won’t give away the show, except one detail...Jesus is glorified in a breathtaking live nativity! 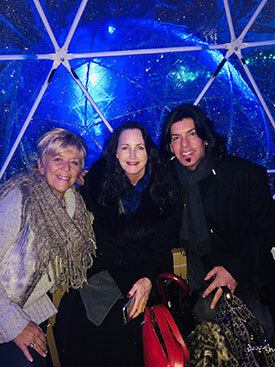 After the show, we braved the weather, and the unbelievable crowds of people to see the Sak’s 5th Avenue Christmas light show and Grand Central Station. Even though it was cold and rainy every day, it did not detract from our magnificent NYC adventure! I told you we were going to paint the town red, but the city beat us to it. Everything was red, green and gorgeous. Like the line from the Christmas song, “Silver Bells...It’s Christmas time in the city,” make no mistake about that! The contest winners shared with us that this was a blessing they will never forget, and neither will we. And I will never forget you, the Wholetonians, for your support this year, for participating in our Black Friday sales and “Refer-a-friend” program. Hopefully we can do it again next year when I release something EVERYONE is asking for, “Wholetones Christmas, Volume 2”! I also want to thank you for understanding our growing pains and the delay in getting you your Wholetones TO GO Gen2 players. Some things are out of my control. So when a shipment gets stuck in customs, that's a huge deal. Thank God, they were finally released and we are getting them out ASAP! Also, for the first time in our short history, you wiped me out of the Wholetones Christmas Volume 1 CD as well as The Making Of Wholetones Christmas DVD! I do not have one copy left in stock. But I promise, next year we will have not only Volume 1, but Volume 2 as well! I am really looking forward to taking a break from my travel and work for a few days of family fun, in celebration of the greatest gift ever given, God’s perfect Son, Jesus, given to us, to heal us, and save us. That is what Christmas is…the celebration of the birth of Christ!